Mom. Stop feeding Anthony. I’M HUNGRY! Thanks for feeding me Mom. 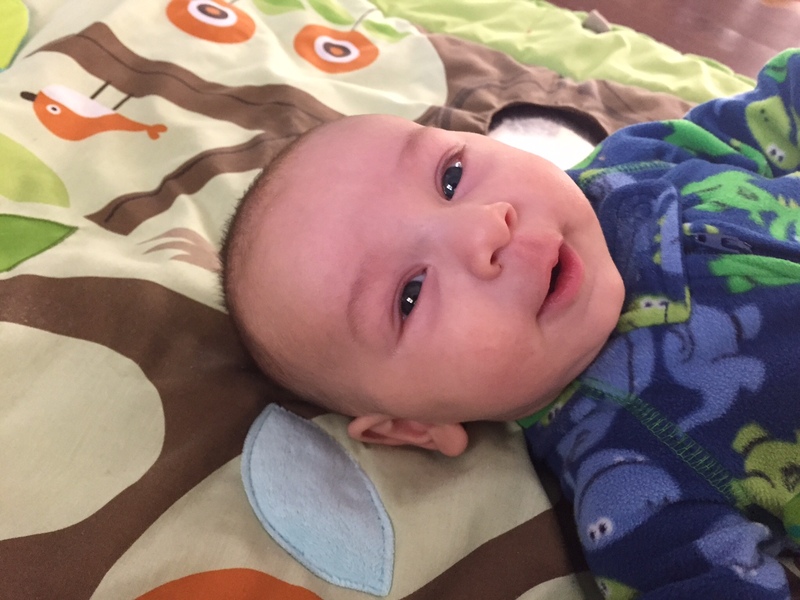 Now go feed Joey while I’ll sit here, smile, and relax. Do you blame me for creating this quick, healthy, easy-cleanup meal? I didn’t think so. The pre-dinner meltdown and comedy show is the main reason why I’ve been making one-pan roasted sausage, potatoes, and onions almost once a week for the past 3 months. No joke. Not only does the one-pan cleanup make this meal a recipe box keeper, the chicken sausage is a source of protein my Mr. Joey will eat. I’m finding that Joey turns his nose up at most meat unless it can A. be dipped in BBQ sauce or B. it doesn’t look like meat. This recipe fulfills requirement A! Now the sausage, potato, and onions are just a simple base. You can adapt this recipe to include other vegetables fit for roasting, such as peppers, sweet potatoes, squash, broccoli, etc. You can find my full-proof tips and tricks for roasting vegetables here. 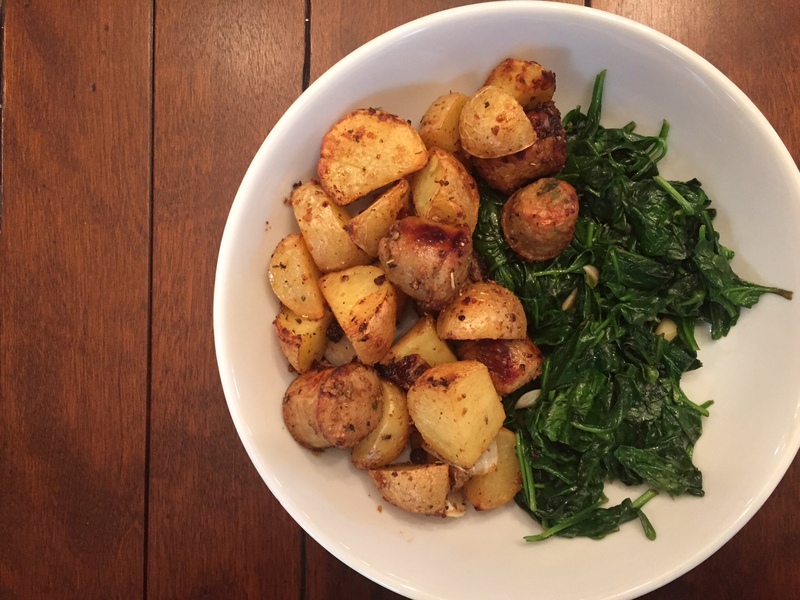 Even though the roasted sausage, potatoes, and onions make a meal, I like serving it alongside something bright and colorful, like spinach! So if you follow MY recipe pictured here, this will be a two-pan meal… it’s still worth it! Preheat your oven to 400. In a large bowl, combine all of the ingredients. Mix well. Pour onto a baking sheet and place in the center rack of your oven. Bake for 15 minutes. Stir and sprinkle with Parmesan cheese. Bake for an additional 15 minutes. Slice sausage and serve immediately. I’d also suggest playing around with the seasonings depending on what flavor of sausage you decide to roast. Apple chicken sausage? Sprinkle in some sage. Spicy Italian sausage? Sprinkle in some brown sugar for sweetness. Because Mr. Joey enjoys a bite or two of the sausage, I usually buy sweet Italian sausage and mix and match the veggies depending on what’s in the fridge! As long as I make his plate with BBQ sauce or marinara sauce for dipping, he’ll take more than one bite. Here’s to hoping this meal provides you with an easy weeknight meal solution, free of whines, cries, and a sink full of dishes! If you’re looking for other easy weeknight meal solutions, check out my Healthy Dinner Recipes Pinterest board. 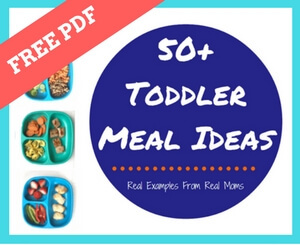 I can guarantee the recipes are simple, healthy, and somewhat toddler approved! We had potatoes like that last night but grilled them! OMG. those faces. I’m a fan of sausage and potatoes too. This looks delicious! Recipes with sausage are always a win for me! 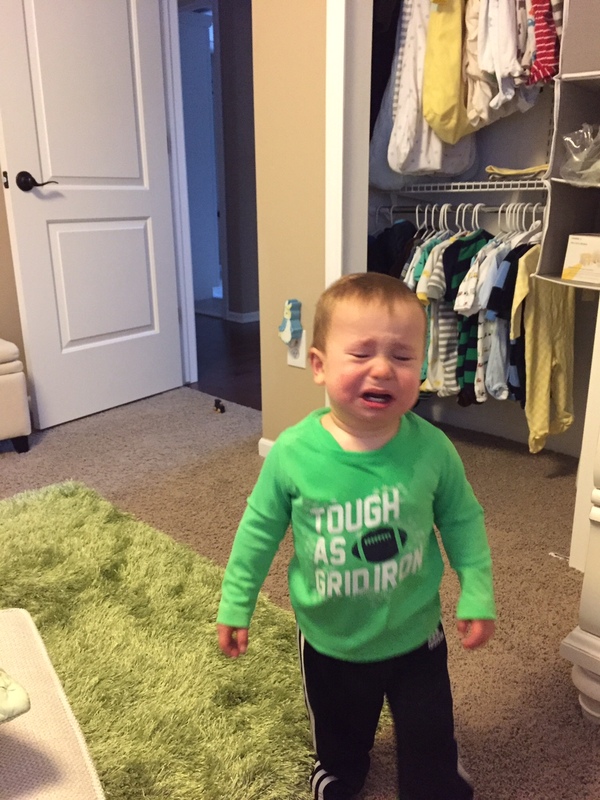 We experience both the pre-dinner and pre-lunch meltdowns and I just have one kid! Lol! I think it’s just the way of the world with toddlers… Am I right?! “An hour before dinner in a house with two small children is no laughing matter.” Ha! So true. I remember those days well. Hang in there! In the meantime, looks like a perfect meal for those kinda nights! I like doing sausage and pasta with greens or asparagus, lots of olive oil, some pasta water, and fresh Parmesan. Yum!!! I need to try that next. I’m much more of a pasta fan vs. potato… The guys like potatoes. Go figure! Thank you for the recipe!! Turned out great!! !